Ancient Incan Rings of Moray. Grouped together in Peru’s lush Cuzco region, the ringed Incan ruins known as Moray have long been a mystery, but it is looking more and more likely that the nested stone rings may have been part of a large-scale agricultural experiment. Unlike a number of the elaborate metropolises and statuary left behind by the Incan people, the rings at Moray are relatively simple but may have actually been an ingenious series of test beds. Descending in grass-covered, terraced rings, these rings of rings vary in size, with the largest ending in a depth of 30 meters (98 feet) deep and 220 meters (722 feet) wide. Studies have shown that many of the terraces contain soil that must have been imported from other parts of the region. 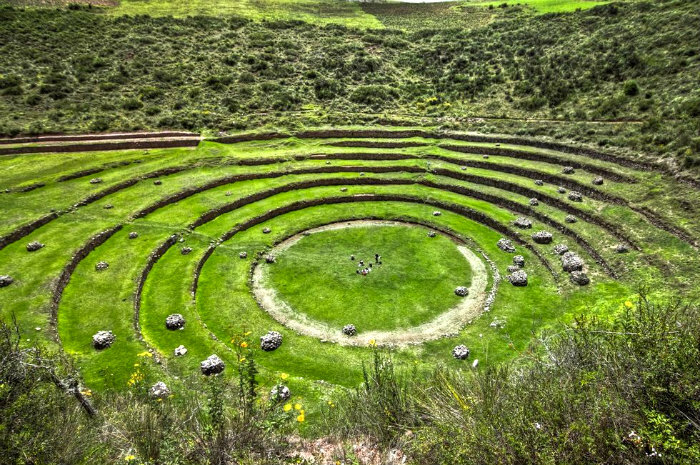 The temperature at the top of the pits varies from that at the bottom by as much as 15ºC, creating a series of micro-climates that — not coincidentally — match many of the varied conditions across the Incan empire, leading to the conclusion that the rings were used as a test bed to see what crops could grow where. via Moray | Atlas Obscura. This entry was posted in PLACES AND TRAVEL and tagged ancient, Peru. Bookmark the permalink. ← The Magic of Perfectly Timed Photos.